First, we should know when and how to change Lexmark ink cartridges. The warning message appears when there is low or no ink in the cartridges. At times, the cartridges may not be positioned properly. Always refill the Lexmark ink cartridges with Lexmark ink brand as only it is compatible to get good quality prints. 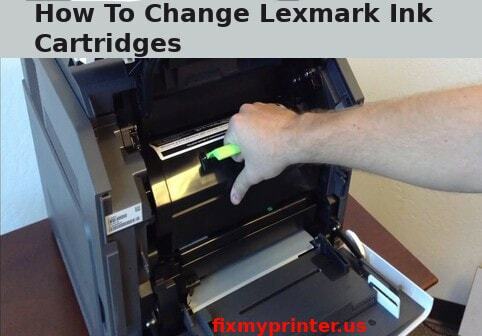 Below are the general steps to change the ink cartridges in Lexmark printers. Tap the Power button on the Lexmark printer to turn it on. Now, lift the access door or the scanner door. Immediately the cartridge holder moves to the center of the machine. Push down the cartridge holder latch. The holder lid will open. Take the empty or low ink cartridges out. Take the new ink cartridges from the package. Remove the stickers and tapes from the cartridge. Don’t touch the copper contacts or the metal nozzles on the back or the bottom of the cartridges. Insert the new ink cartridges in the appropriate slots. Place the black ink cartridge into the left slot and the color ink cartridge into the right slot. Fix them by pressing down the carriage to lock into their place. Close the access door of the cartridge. Step 1: For good quality prints, the Lexmark ink cartridges should be replaced frequently by following the upcoming guide of how to change Lexmark ink cartridges. Generally, we receive a text on the display when the ink cartridges are empty or low. If you continue printing with low or empty ink, the print appears to be stripped or faded and makes your document look unprofessional or hard to read. So to avoid this issue, replace the ink cartridges frequently. Step 2: Below are the detailed steps to replace or refill empty or low ink cartridges. First, power on the Lexmark printer. Then, lift the access door or the scanner lid. You will find the cartridge holder automatically move to the center of the machine. To open the holder lid, press down the cartridge holder latch. Step 3: Now remove the empty ink cartridges from the holder. Clean the removed ink cartridge area with a dry cloth. Take the new ink cartridges from the package. Remove all the tapes and stickers from the bottom of the new ink cartridges. Note: Never touch the contacts or the metal nozzles on the back and bottom of the cartridge. Now insert the new ink cartridges into the respective slots. Place the black ink cartridges into the left slot and the color ink cartridges into the right slot. Step 4: Now, press down the lock of the cartridges to fix into the appropriate place. Close the cartridge access lid and then close the access cover or the scanner lid. The alignment message appears on the printer. Now, load the input tray with papers if it is not filled already. Press the option Yes for a test print on the printer control panel. You can now check the quality of the print. Step 5: To change or replace the toner cartridge in Lexmark printers, follow the below procedure of how to change Lexmark ink cartridges. Open the front cover of the printer. Now, pull down the multi-purpose feeder door. Then, pull the cartridge from the printer using the cartridge handle. Take the new ink toner cartridge from the package and remove all the packing materials from it. Shake the cartridge nicely to redistribute the toner. Insert the toner cartridge into the printer now. Step 6: To insert the toners properly, align the side rails of the cartridge by following the arrows on the side rail inside the printer. While inserting the cartridges, check that the cartridge is pushed fully inside. An important thing to be checked while replacing the toner cartridge is that, don’t ever leave the imaging unit exposed to direct light for a long period of time. Doing so may result in print quality problems. Now, close the multipurpose feeder and the front cover of the printer. To check the quality of the toner, try printing a test page. Step 7: Few Lexmark printers also have toner cartridges for many colors like Black, Cyan, Magenta, and Yellow. To replace with genuine and compatible ink cartridges or ink toners with the guide of how to change Lexmark ink cartridges for Lexmark printers, always purchase it from the Lexmark T series T650N. The Lexmark ink cartridges are known for its unsurpassed ink quality. These cartridges are capable of printing over eighty thousand pages.